Today is April 1st isn't? Or the 2nd for some of you anyways. If you were expecting an April fool's post too bad, I'm too lazy to actually come up with one. 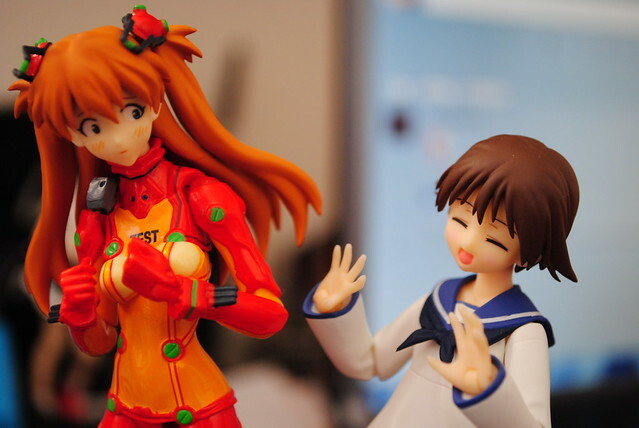 Instead I will just do a lazy post with a single picture of Miyafuji sizing up Asuka. On another note, I'm quite saddened. I had to put away brand new boxed figures into storage in my closet. I really want to display them all, it's not cool having no space. One more thing of note, not too long I added another item to the menu up on top. A page containing all of my lovely figure stories which amount to a grand total of two. Got several ideas that I want to make in the near future. One of which is for a really special post next time.